The president of Tepco, which operates the crippled Fukushima nuclear power plant, has resigned as the firm reported a loss of 1.25tn yen ($15.3bn; Ã,Â£9.4bn) for the past financial year. Masataka Shimizu will be replaced by managing director Toshio Nishizawa. Tepco's loss is a record for a non-financial firm in the country. The earthquake and tsunami that hit Japan on 11 March severely damaged the Fukushima plant and it has been leaking radiation ever since. Mr Shimizu spoke to a packed news conference at its headquarters in Tokyo with Mr Nishizawa standing to his left. "I wanted to take managerial responsibility and bring a symbolic close," said Mr Shimizu. "We put the highest importance on experience and expertise in our business operations when we chose the person for the top post," he added. His resignation had been widely expected. The net loss of 1.25tn yen is the biggest in Japan's corporate history outside the financial sector. In the previous financial year, the company had reported a profit of 134bn yen. However, overall losses from the disaster are expected to be much bigger. 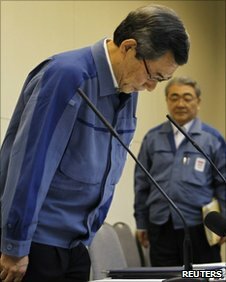 Thousands of people have been evacuated from the region around the nuclear plant, and the company has been charged with cleaning up the problem and paying compensation to the victims. According to Bank of America Merrill Lynch, total compensation claims could reach as much as 11tn yen. Last Friday, the government announced a plan to create an entity to help Tepco compensate the victims of the nuclear crisis. Authorities have also been studying possible bail-outs, including using contributions from other utilities and taxpayer money.